In 2011 Mark Schnitzer’s Lab in Stanford came up with a brilliant technology: a miniaturized integrated microscope that can be implanted on a mouse head (read the paper here) to observe cell activity while the mouse is free to move around and perform behavioral tasks. This technology is now available thanks to Inscopix, Doric, and UCLA Miniscope (an open-source venture). This microscope, and the novel approach that comes with this technology, is indeed revolutionizing neurosciences. Now we can directly observe hundreds (up to ~ a thousand) of neurons in realtime while the animal runs a behavioral task (sniffing, interacting, learning, retrieving information …). The dream of many behavioral neuroscientists comes true. These many cells can also be observed for many days. We keep track of the identity of all these cells and follow their activity for days or weeks. Another dream (especially for memory researchers) comes true. Let’s get this out of the way ASAP: the microscope allows the observation/quantification of calcium dynamics. This is NOT electrical activity (currents, spikes…). So what’s the relation between the changing levels of intracellular calcium and the electrical activity (spiking, in particular) of the cell? it looks like there is a monotonic relationship between the two according to this paper (Large-Scale Fluorescence Calcium-Imaging Methods for Studies of Long-Term Memory in Behaving Mammals.). However there is no clear way to determine the number of spikes just by looking at calcium changes (unless you first do an ad-hoc e-phys study on your cell-population of interest). My point of view: I’m not particularly concerned by these issues. I am interested in behavior. I am curious to see how cell activity (whether it’s calcium, current, spikes) varies, covaries and coordinates according to changes in behavior. Brain changes <—> Behavior changes. This is fascinating. a lot! What does all this activity mean? Multiple data dimensions can be plotted at once. Calcium imaging in freely-moving subjects produces ultra-dimensional data … and beautiful visualizations. People are collecting data and a fraction of these researchers are publishing these data (i.e. papers). However, the general feeling is that we are collecting a huge amount of data and we have no idea if what we collect is a pearl of deep knowledge or just a garbled jungle of meaningless numbers. Are we entering the dark ages of Neuroscience? What throws off many scientists is the dimensionality, rather than the volume, of data. Spatial resolution (cellular): the 2D/3D coordinates of every single cell recorded. 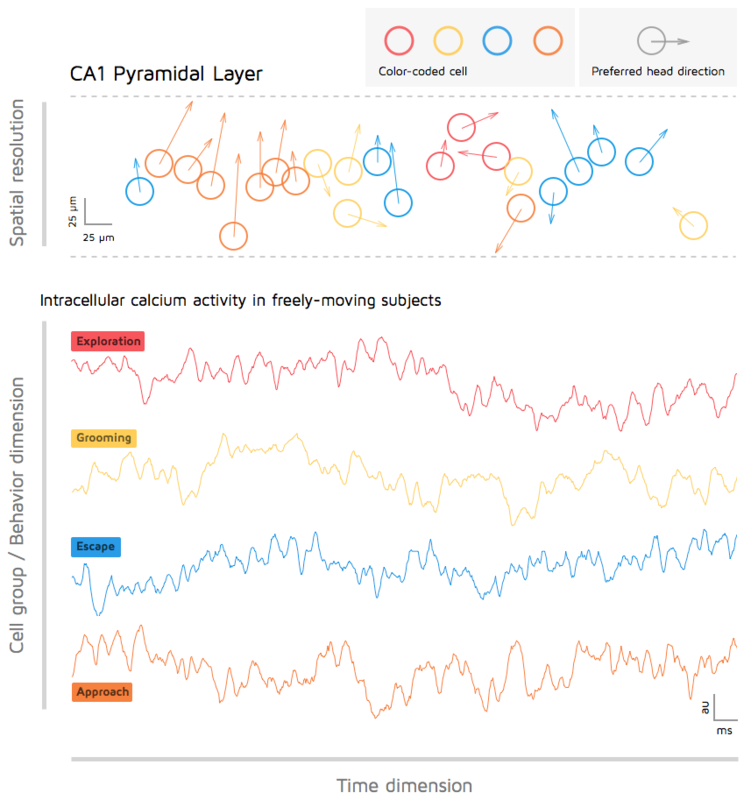 Time: activity of each cell on the ms scale for days/weeks of recordings. Spatial resolution (animal): x-y coordinates, and Z according to this paper, direction, and speed. Point #4 (Behavior dimension) is what intrigues me the most and is -I believe- the key to solve the dimensionality issue. Previous articleBig Data, Restructured: As Data Increases in Volume, What Lies Around the Bend?